O God, who show the light of your truth to those who go astray, so that they may return to the right path, give all who for the faith they profess are accounted Christians the grace to reject whatever is contrary to the name of Christ and to strive after all that does it honor. Through our Lord Jesus Christ, your Son, who lives and reigns with you in the unity of the Holy Spirit, one God, for ever and ever. 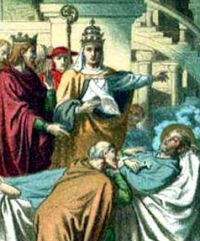 St. Alexius was an Eastern saint whose veneration was transplanted from the Byzantine empire to Rome, whence it spread rapidly throughout western Christendom. Together with the name and veneration of the Saint, his legend was made known to Rome and the West by means of Latin versions based on the form current in the Byzantine Orient. He was famous for his extraordinary self-denial. Before the reform of the General Roman Calendar today was his feast. 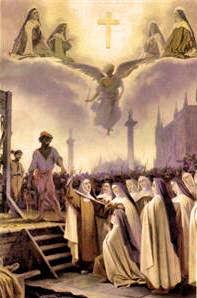 Historically today is the feast of the Blessed Martyrs of Compiegne, sixteen Carmelites who are the first martyrs of the French Revolution that have been recognized. They were guillotined on 17 July 1794 at the Place du Trône Renversé (modern Place de la Nation) in Paris, France.